A large majority of Engineering undergraduates are interested in conducting undergraduate research. Yet, many interested students cannot find opportunities to participate in research. This is for two key reasons: (1), students do not know where to look for research opportunities, and (2) students in different majors have varying levels of success in acquiring research opportunities aligning with their interests. Therefore, it is critical to further publicize research opportunities, for example by publicizing EDAB’s document on “finding research opportunities”. Furthermore, an investigation into research discrepancies between departments within Penn Engineering as well as with student interests would be prudent. This section seeks to evaluate undergraduate research opportunities in Penn Engineering, and aims to assess how Penn Engineering can more effectively provide for undergraduates seeking engineering research opportunities. In total, 65.1(±5.8)% of undergraduates have some demonstrated form of interest in research. 39.1(±3.5) % of undergraduates wish to participate in undergraduate research but have not been able to find an opportunity at Penn. 17.3(±1.6) % of undergraduates believe that there is a lack of undergraduate research opportunities at Penn. The majority of Engineering undergraduates have interest in conducting research. However, within that population, a significantly large portion (~40%) of Penn Engineering undergraduates have not obtained research positions. If we stratify this population by year, and discount freshmen, who in general, have not made an active attempt to pursue research opportunities, we are still left with a staggering (~29%) of undergraduates who wish to conduct research, but cannot find a position. 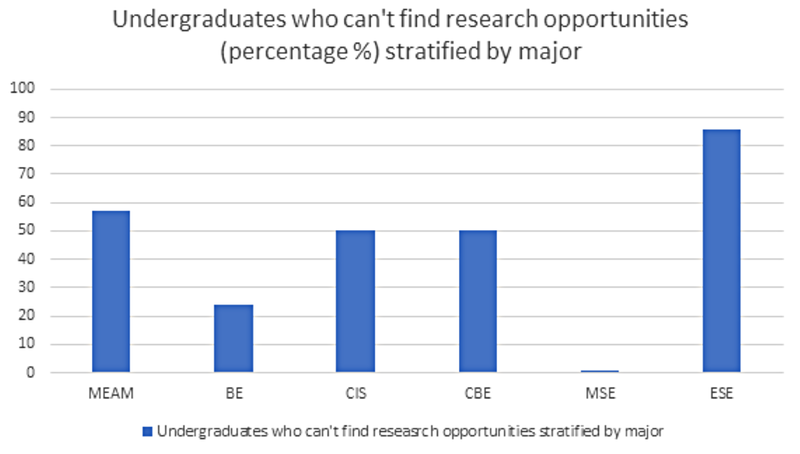 Stratifying undergraduates interested in research by major show that ESE majors have a disproportionately hard time finding research opportunities. 85.7% of ESE majors wish to conduct undergraduate research, but can’t, while the average for other departments is around 50%. This points to discrepancies in available research opportunities between departments. There are two main groups of students that wish to pursue undergraduate research, but cannot: Students that do not know where/how to look for opportunities, and those that know where to look, but find no opportunities available. For the former cohort, we recommend that Penn Engineering RAS publicizes EDAB’s previously published “Guide to Undergraduate Research” and/or publicize their own guide. For the later cohort, EDAB recommends that administration first look into reducing the gap in research opportunities between departments (specifically ESE). To this end, possible options include pushing professors in ESE to offer more undergraduate research positions, or creating specialized research programs to target ESE students.